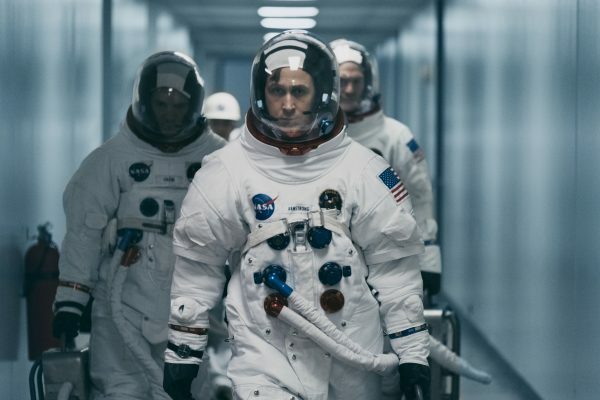 A new movie about the moon landing has omitted the American flag-planting, stirring controversy over a key part of the monumental achievement. Starring Ryan Gosling and directed by Damien Chazelle, “First Man” premiered this week in film festivals and will hit theaters in October. The movie focuses on Neil Armstrong, perhaps the most famous astronaut in the history of the Earth for being the first human to set foot on the moon in 1969 and plant the American flag. The moon landing was the result of a space race between the United States and the Soviet Union and cost America about $110 billion in today’s dollars. Both Chazelle, a French-American who was born in Rhode Island, and Gosling, a Canadian, have defended the choice of omitting the iconic flag-planting moment. “I show the American flag standing on the lunar surface, but the flag being physically planted into the surface is one of several moments of the Apollo 11 lunar EVA that I chose not to focus upon,” Chazelle said in a statement, reported Deadline. Gosling told the Telegraph that the decision was deliberate. Armstrong’s sons also defended the choice, although the pair noted that Armstrong “was an American hero,” in a statement published by Deadline. Others, though, said the decision would not have been supported by Armstrong, who died in 2012 at the age of 82. Chuck Yeager, a friend of Armstrong’s who fought in World War II, was among those reacting negatively to the omission. “That’s not the Neil Armstrong I knew,” he said, in response to a fan who noted that some people were claiming Armstrong would have supported the omission of the flag. Guys, Marvel/Disney had Chinese delegates on the set of Iron Man script supervising what could or could not be included in the story. Their culture war on 50% of US audience is strictly because they think you’ve been replaced at the box office. And there was also talk that the omission of the American flag was an effort to ensure the film would play in China, which has become a coveted venue for directors and producers. “Marvel/Disney had Chinese delegates on the set of Iron Man script supervising what could or could not be included in the story. Their culture war on 50 percent of US audience is strictly because they think you’ve been replaced at the box office,” said Stephen Miller, a Fox News commentary writer.